WASHINGTON, WASHINGTON DC, UNITED STATES, February 12, 2019 /EINPresswire.com/ — According to the statistics, Android has got globally an impressive market share in Smartphones with over 87.8%. Android app development services are dominating thriving in the mobile space. Thus, many entrepreneurs are investing in developing android apps for their businesses. 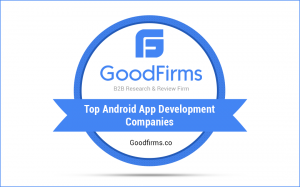 Therefore, to assist the service seekers to meet the best partners, GoodFirms has published the catalog of Top Android App Development Companies based on their credibility and ability to deliver top-notch services to their clients. Mobile App Development field has given the entrepreneurs a chance to transform their business into customized apps and reach maximum people around the globe. These days, Android and iOS have become the major platform in the world of apps. At GoodFirms, you can find the list of Top iPhone App Development Companies and android developers along with genuine rating and reviews. GoodFirms is a worldwide recognized B2B research, ratings and reviews platform. It endeavors to connect the service seekers with the top IT development companies, best software and other agencies from various industry segments. The research team of GoodFirms pursues a strict methodology which incorporates three vital criteria's that are Quality, Reliability and Ability. These key factors are also included with other several metrics such as identifying the past and present portfolio to have a clear idea about the background, verifying the years of experience in the same domain, their focus area, market penetration, client feedback and other statistics. Every company is assessed through this research process and compared with each other before indexing them in the list of most excellent companies. Moreover, GoodFirms motivate the service seekers by asking them to engage in the research process and grab an opportunity to get listed in top agencies. Getting listed at GoodFirms will be an opening of a wide door from where you can be a magnet to customers globally. GoodFirms has cultivated a list of Top Mobile App Development Companies from every country, state and city considering numerous qualitative and quantitative measures. GoodFirms is a Washington, D.C. based research firm that aligns its efforts in identifying the most prominent and efficient mobile app development companies that deliver results to their clients. GoodFirms research is a confluence of new age consumer reference processes and conventional industry-wide review & rankings that help service seekers leap further and multiply their industry-wide value and credibility.